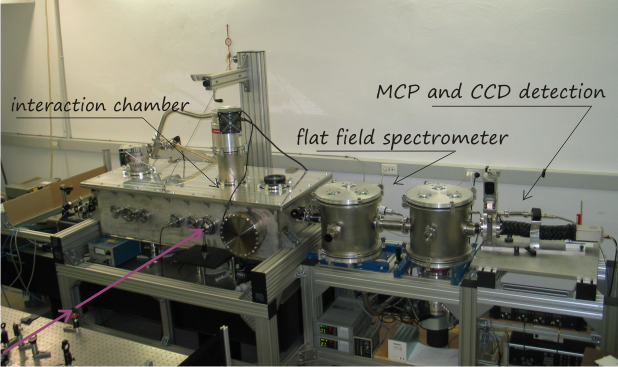 This laboratory is dedicated to the development of mid-IR parametric sources for atomic and molecular spectroscopy by high order harmonic generation. Synchronized laser sources with different pulse duration and center wavelength are available for the rotational, vibrational and electronic excitation of the molecular sample. The laboratory is equipped with a terawatt class laser system based on Ti:sapphire (800 nm) delivering 60-fs pulses with an energy up to 120 mJ and a repetition rate of 10 Hz. 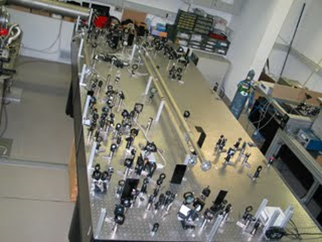 Starting from a portion of the terawatt beam, an optical parametric amplifier (OPA) has been developed. The OPA delivers pulses tunable between 1.2 and 1.9 µm, with an energy of 1.5 mJ, duration of 20 fs and passive carrier envelope phase stability. The laboratory is equipped with a vacuum chamber for high order harmonic generation. Harmonics are generated by focusing the driving laser pulse into a synchronized pulsed gas jet. The XUV radiation is collected and analyzed by means of a flat field XUV spectrometer in the spectral range between 16 and 200 eV.